As rumors swirled about the White House gossip contained within Michael Wolff’s Fire and Fury, President Trump’s legal team tried to block the book’s release by threatening to sue the publisher. This foray into book banning only managed to drum up more interest in the tome, and move up its release by a few days. Nine months later, the administration is facing the release of another book full of wild allegations about life in the Trump White House. 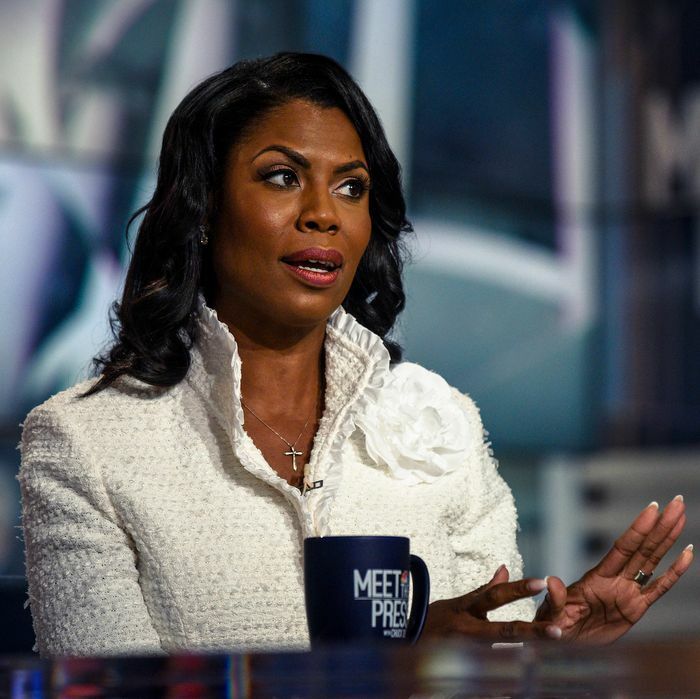 But rather than trying to prevent Omarosa Manigault Newman’s Unhinged from hitting bookshelves on Tuesday, Trump allies are making vague claims about how the former director of communications for the Office of Public Liaison might have broken the law by secretly recording conversations in the White House. They may be able to convince more Americans that the former Apprentice villain has a “lack of character and integrity,” as White House press secretary Sarah Huckabee Sanders said on Sunday. But it seems unlikely that she violated any laws, and pressing the point raises new questions about security in Trump’s White House. Sunday on Meet the Press, Manigault Newman released a tape publicly for the first time, playing a recording of White House chief of staff John Kelly firing her. Since the conversation took place in the Situation Room, many conservatives declared it was not just illegal, but a threat to national security. Omarosa recording a conversation in the Situation Room would not only mean she broke the law, but that she deserved to be fired. Former White House press secretary Sean Spicer told ABC News that Manigault Newman had “top secret” security clearance at a minimum, which would have involved agreeing to security protocols, so she might have violated federal law. Spicer didn’t elaborate on this new realm of legal consequences. Washington, D.C., has “one-party consent” on recordings, so merely flicking on her recorder without telling Kelly isn’t illegal. (As Law & Crime notes, she could be in trouble if she secretly recorded conversations at Mar-a-Lago, as Florida has two-party consent.) Legal experts and former national security officials said that while the security implications are concerning, the recording probably isn’t illegal. But while cell phones and recording devices are barred from the room, Price said that in his experience there was no screening process. “It’s a system based on honor and integrity, and there’s a sign outside that says, ‘Place your phones here,’ ” he said. National security lawyer Bradley Moss said that as long as classified information wasn’t discussed, merely recording a conversation in a Sensitive Compartmented Information Facility isn’t a crime. Was any law broken by Omarosa's apparent recording inside Situation Room? @BradMossEsq: "In and of itself, there is no criminal provision implicated. If there isn't national defense information or classified involved, merely recording...in a SCIF is merely a security violation"
That would be the fastest Supreme Court smack down against a President. There’s two distinct issues here in my mind. One is a party that’s lost its collective mind and wants to imprison opponents. The other is the rules in a SCIF. No one frisks you on the way into the sit room. It’s sloppy, against the rules and bad opsec but it’s on her. After initially suggesting that Manigault Newman might have broken the law, Lawfare executive editor Susan Hennessey said that’s probably not the case since didn’t have security clearance. Going into the conversation, Kelly had anticipated a fight, according to two senior administration officials. And rumors had also begun to spread through the White House that Manigault Newman was recording conversations, according to a former senior administration official. Those people said that’s why Kelly took Manigault Newman into the Situation Room, where officials are asked to surrender their electronic devices, which are put under lock and key, before entering. Apparently Kelly didn’t take sufficient steps to make sure a person being fired for, as he puts it, “some pretty serious integrity violations,” actually followed the rules. And there’s the larger question of why Trump thought it was a good idea to hire a notorious TV villain to work in the White House. But at this point, it doesn’t look like there’s much Trump officials can do to stop Manigault Newman from dishing on her time in the administration. ABC News reported that Trump administration sources are afraid of what she might release next — which may be why they’re floating the dubious possibility of legal consequences.